The Lodge at Cathedral Pines offers guests an elegant yet rustic venue for intimate wedding ceremonies and receptions, bridal teas, private parties, corporate functions and much more! 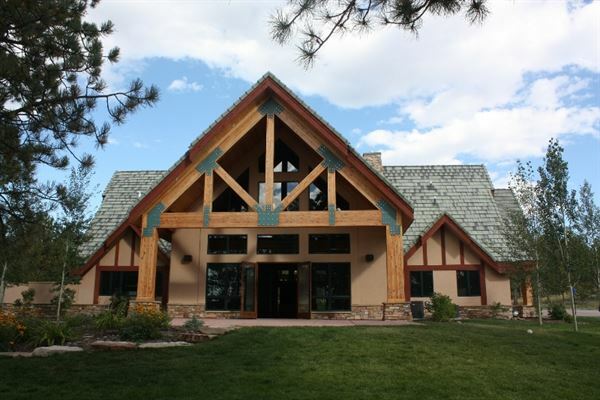 Surrounded by towering Ponderosa Pines, elegant water features and nature at its finest, The Lodge gives your guests a glimpse into all that is Colorado. Our facility can comfortably accommodate approximately 150 guests. We also have a large 32' x 32' outdoor patio overlooking the water features and pines that is able to hold more guests during the summer season. We are a complete do-it-yourself facility located in the heart of Black Forest. Our site is private, serene and intimate. It is perfect for any event, maximum indoor occupancy is 104. Included Facility Equipment • 16 – 48” round tables that can seat up to 6 chairs each • 4 – 6’ banquet tables and 100 chairs. • 8' x 8' projector screen • Sound system capable of playing CD’s, cassettes, the radio, MP3’s and is I-pod/laptop compatible • 3 microphones (2 hand held and 1 wireless) • Large catering kitchen with a small ice-maker, small microwave, commercial freezer, commercial refrigerator and commercial warming oven. The kitchen has portable, and stationary, stainless steel surfaces for food prep stations. A Facility Manager will be assigned to your event and will handle the set-up and take-down of tables and chairs for your event. They are also on-site throughout your event to assist with maintenance matters and oversee the building and replenishing restroom paper products during your event. Off-Peak Rates (Jan/Feb/Mar/Apr/Nov/Dec) are as follows: All Friday, Saturday and Sunday event dates rent at the rate of $1,800 for a ten consecutive hour block of time. Monday – Thursday event dates have two options; five consecutive hours for $950 and eight consecutive hours for $1,300. On-Peak Rates (May/Jun/Jul/Aug/Sept/Oct) are as follows: All Friday, Saturday and Sunday event dates rent at the rate of $2,500 for a ten consecutive hour block of time. Monday – Thursday event dates have two options; four consecutive hours for $1,400 and eight consecutive hours for $1,800. Additional hours are available to purchase, with any block of time, at $150 per hour.